We welcome Billy into our family as he joins Toby’s Foundation in the fight against canine epilepsy. Billy has big shoes to fill. Toby shared our love and lives during the first five years of Toby’s Foundation and was an integral part of our family and the reason we started Toby’s Foundation. Though no one can ever replace Toby and we still miss him more than words can say and probably always will, Billy has managed to wiggle his way into our hearts and make his own place in our lives. We wish for Billy and all Aussies a long and healthy life! Please see our ad with Billy in the July/August issue of the Australian Shepherd Journal and Aussie Times and on our website. Dr. Patterson reports that during the past year 18 additional affected Aussies and 20 additional controls have been collected at University of Minnesota. They are continuing to try to collect more Aussie DNA samples to be sent to their lab in Minnesota for any needed future analysis and to verify the diagnosis whenever possible.The most important efforts will be to collect more samples of affected Aussies.They are analyzing the best 24 affected and 24 unaffected Aussies on the new more powerful SNP arrays during the next few months. Despite the complexity in Aussies they are committed to following through on the search for markers and genes in Aussies as long as funds and new DNA samples are available. EPILEPSY RESEARCH NEEDS YOUR HELP! When the current grant for Aussie Epilepsy research ends more funds and blood samples from affected dogs will be needed to continue to move the research forward. Please make a donation to Toby’s Foundation for the research and send in a blood sample on your affected dog to the University of Minnesota. Please go to www.tobysfoundation.org/samples.html for information, forms and instructions on submitting blood samples for the research and to make a tax deductible donation on line or via mail please see the information below under charitable giving. Thank you for your help in the fight against canine epilepsy. 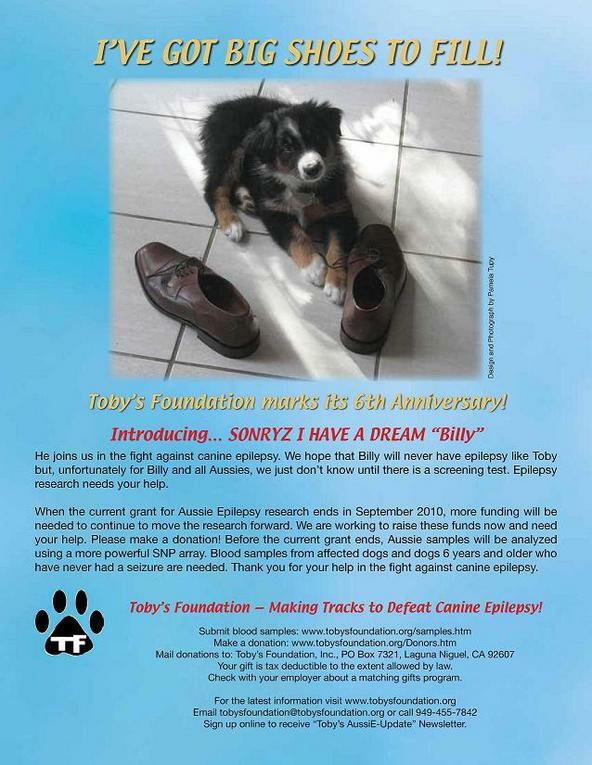 Toby's Foundation - Making Track to Defeat Canine Epilepsy!